Thomas Bellacci (aka Thomas of Florence, 1370 to 1447 AD), a patron of butchers, was a butcher’s son. He was born in Florence, Italy, of parents who came from Castello di Linari in Val d’Elsa. 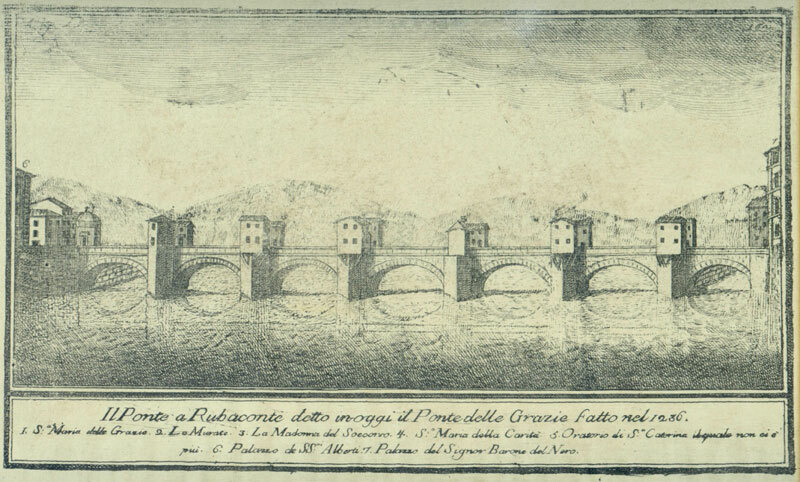 The house he was born in was on the Ponte alle Grazie in Florence. This bridge (or rather, a previous incarnation of it) had houses on it for hundreds of years, just as the Ponte Vecchio still does. Bellacci became a butcher himself, helping his father in his work. When young, though, he was a wastrel. 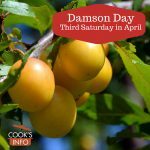 He always got himself in trouble, until finally he was falsely accused of a serious crime when he was around the age of 30. He was helped out by a citizen named Angelo Pace; Pace introduced him to some friends of his who were monks, who in turn inspired him to a life of prayer. In 1405, Bellacci joined the Franciscans in Fiesole, just north of Florence, even though he was a lay person. Even though he was never ordained, he established several monasteries in southern Italy. Pope Martin V (Pope from 1417-1431) made him Vicar General of Tuscany, and used him to preach against the Fraticelli, an offshoot of Franciscans that were branded as heretics. In 1438, he went with Alberto da Sarteano to Syria and Egypt on a trip to meet various churches to discuss reunification of the Christian churches. In Egypt, Alberto fell ill and returned to Italy, making Bellaci the head of the mission. In attempting to travel on to Ethiopia, he was captured by the Turks three times. The first two times Florentine merchants secured his release; the third time the Pope himself paid for his ransom. He returned to Italy in 1444 or 1445 and stayed for two years in a convent in Abruzzo. He died 31 October 1447 in a Franciscan convent at Fonte Palomba near Rieti, at the age of 77, while returning from a trip to Aquila. He was beatified by Pope Clement XIV in 1771. To be clear, he’s actually not a “full” saint. And, note that there are many patron saints of butchers in addition to Bellacci. Despite his being a Patron of Butchers, he himself in later life ate only bread, root vegetables, and water. He is also referred to as Thomas of Florence, Tommaso Bellacci, Tommaso de’ Bellacci, Tommaso da Scarlino, and Beato Tomma. 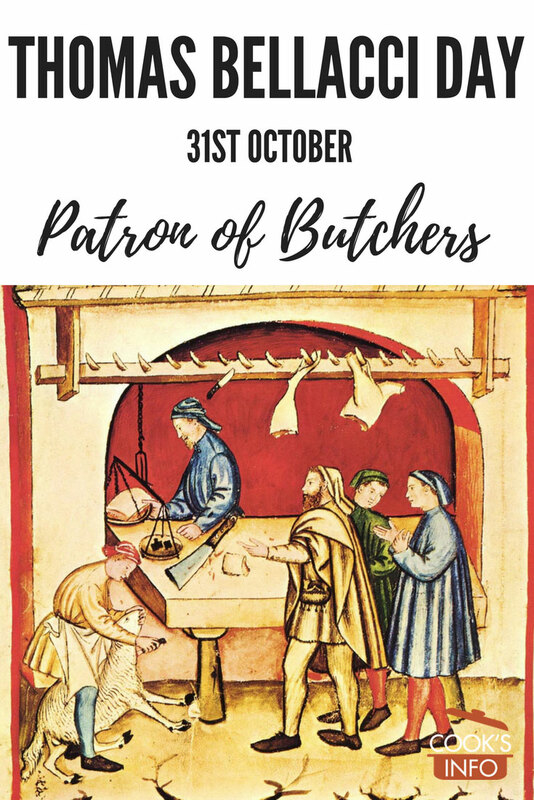 His feast day is 31 October to mark his death, but in practice it’s celebrated by butchers on the last Sunday in October. From about 2000 on, a butcher named Dario Cecchini has organized village celebrations in Panzano, Tuscany. 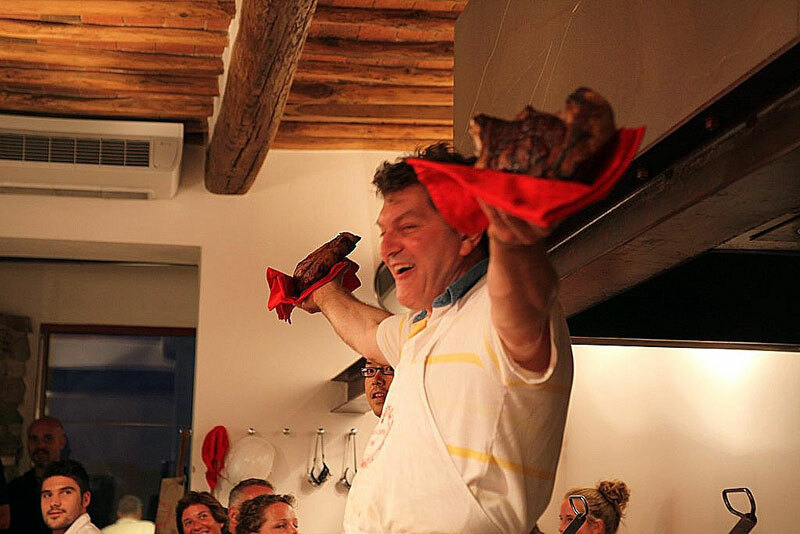 Dario Cecchini, organizer of the Thomas Bellacci celebrations in Tuscany.